The Back to School countdown is on -- we're less than 2 weeks until the kids are back to class. 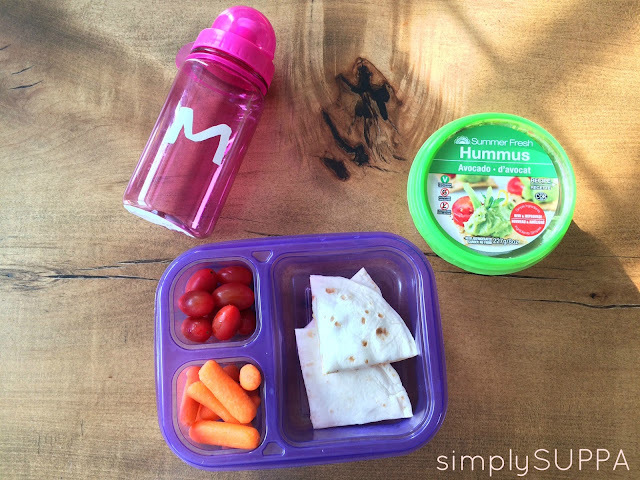 Last week, I gave you some suggestions on back to school lunches. Thank you to those who wrote to me to share their tried-and-true lunches. I will definitely add them to my list. You may have noticed that I had a few "leftover" dishes on my list. I'm a fan of leftovers; in fact, I eat leftovers almost every day at work. The beauty of some leftovers is they don't have to be served warm; and sometimes, the meal is even better the next day. Quite often, I take my leftovers and turn them into a dish of their own -- cook once, enjoy twice. It's like double duty dinners. And that saves me time, which makes me very, very happy. In addition to double duty dinners, I like double duty sides. Hummus is a side dish that is so versatile and it's ideal for Back to School. It's thick and creamy, nut free, loaded with protein and very good for it. 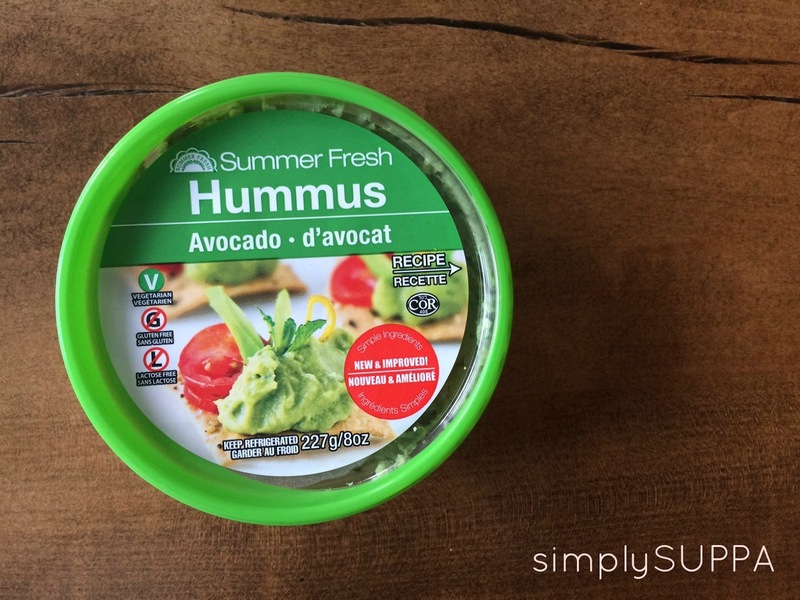 My favourite hummus on the market comes from Summer Fresh. 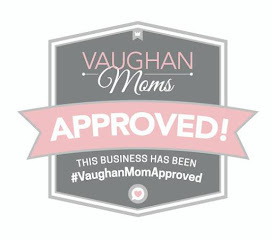 Summer Fresh is a Canadian owned and operated company (actually, Vaughan based!) that specializes in hummus, dips and salads. The company is celebrating 25 years of creating recipes using simple ingredients. They are the masters of hummus, in my opinion. They make everything from a classic hummus, spicy hummus, roasted eggplant hummus, avocado hummus, lemon dill hummus (HAVE to try this one! ), topped hummus, spinach and artichoke, sundried tomato and so much more. 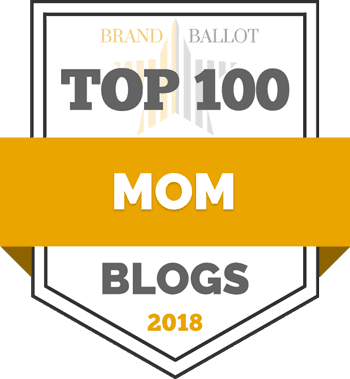 They actually do make a Snack'n Go size and a mini size, but I want to show you just a couple of the ways you can buy one container and use it in various forms in your lunches. As a dip, duh. 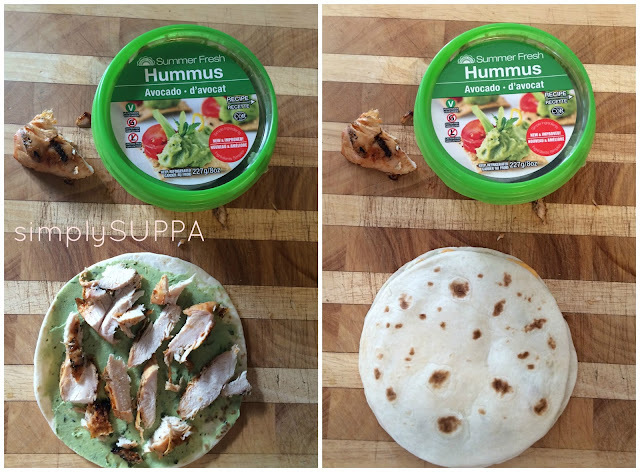 It goes without saying that you can use hummus as a dip. I prepare a platter of fresh veggies for my kids and let them pick what they want to dip. No chips here. If you're a meal planner, you can do this in advance. Scoop out your desired hummus flavour into a little container or bento-style box and add your veggies. So long as you refrigerate, you can prepare this days in advance. OK -- so that's pretty obvious. But how do you take a spread, like hummus, and have it jazz up a leftover that both you and your kids will enjoy? Turn it into a quesadilla. Start with a soft taco and smother it with your favourite hummus. 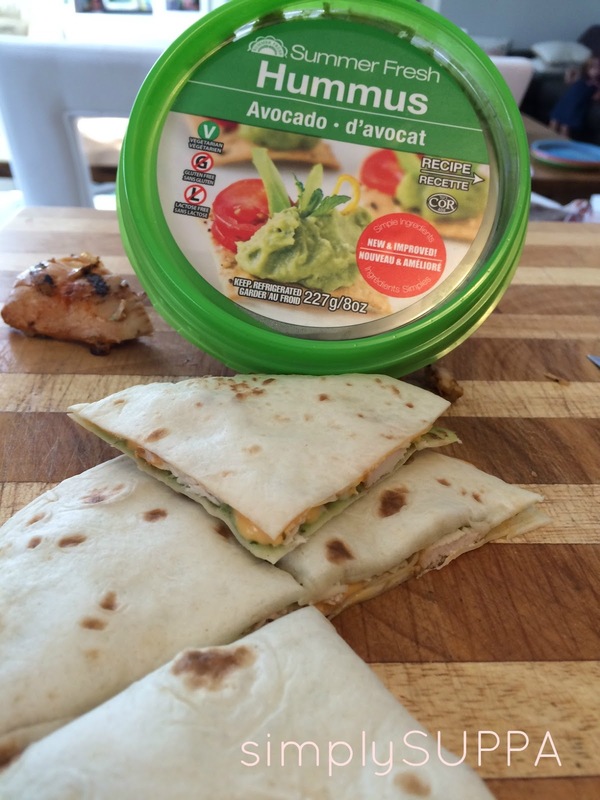 I opted for Avocado Hummus -- it's creamy and has a bit of a Mexican flavour to it. Take a leftover chicken breast and slice it up and lay it on top. You can choose to stop there, or perhaps, add some cheese. Top it with a second tortilla. To heat, either put it in the oven on low for 5 minutes or so, or pop it into the microwave so the cheese glues to the tortilla. Cut into wedges and add to your child's lunch! Add a few more veggies for good measure and you can feel relieved and proud that your kids are getting all four food groups in a lunch that took minutes to make. Not even kidding. What else can you do with the ever-nimble hummus? Toss it in leftover pasta and make a tangy pasta salad. Hummus Pizza anyone? Switch out messy sauce for a yummy hummus and top with pepperoni and any other toppings your kids want. What about as base to a wrap? Summer Fresh has dozens of Back to School ideas for you. For more inspiration on how to incorporate their products into your lunches, visit the Summer Fresh website. Summer Fresh has generously gifted one Simply Suppa reader with a Summer Fresh prize pack, just in time for Back to School. To enter, fill out the recipe below. 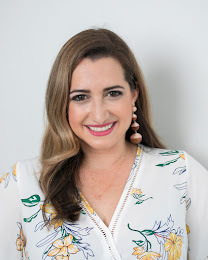 Disclaimer: I'm a part of the Summer Fresh Back to School/Back to Reality Blogger Campaign and receive special perks as part of my affiliation. As always the opinions expressed on my blog are my own. I like to use any left over beef roast or chicken to make sandwiches or salad the next day. We roast and rotisserie lots of chickens and make great chicken sandwiches the next day! my fave is to make extra rice when I am making stirfrys or Indian. The next day I make fried rice and it tastes fabulous. I love to have leftover meat from dinner to toss in a salad at lunch the next day. I use leftover chicken and turkey to make a nice pot of chicken/turkey vegetable soup! I make sandwiches out of leftovers or just reheat them and have them for lunch. I use leftover potatoes in my omelets. Scalloped potatoes work especially well. I use roast chicken for lunch with rice, we always have leftovers! My favourite double duty meal is roast turkey. I use the leftovers in my lunches to make wraps, sandwiches, casseroles and soup.